Indianapolis mom says kids left out in the cold. 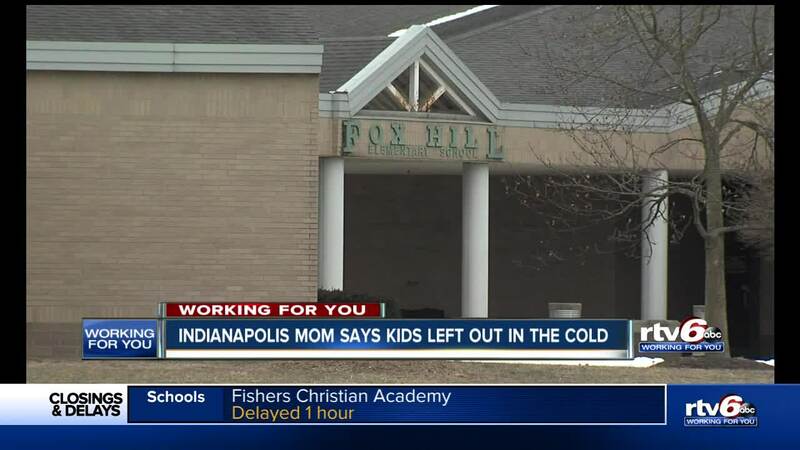 INDIANAPOLIS — A Washington Township mom told RTV6 her kids were left in the freezing cold at Fox Hill Elementary on Thursday afternoon, when they could've been kept safe and warm on the school bus. "There was hundred of kids out there," Brittiany Byers said. When the mother went to pick up her kids from school, after already being upset that the kids had to go to school anyways, she couldn't believe what she saw. "The children were all standing outside, some of them only had hoodies on, some of them didn’t have their coats fully on," she said. A voicemail from the district to parents said a pipe burst and alarms in the school went off. "Due to Indiana code when an alarm signals we must evacuate no matter the weather conditions," the voicemail said. According to Byers, her kids were outside for a long time. She was left wondering why the students weren't allowed to board buses that were standing by. "You have children that are standing outside for 20 minutes, 30 minutes, just waiting to go in the building, or waiting for a bus. And they can’t do either one," she said. The district said the wait wasn't that long. A statement from the district said once they figured out the alarm was due to a bust pipe, and not a fire, students were allowed back in the building to get backpacks. The district then said the students had only been outside for approximately five minutes before loading buses. "I felt like they could have stopped this from happening," Byers said. Several districts around central Indiana canceled school Thursday due to the cold. "They could have kept them home in general," she said. RTV6 is still pressing the district for answers about why kids were required to go to school Thursday. If RTV6 hears back, we will update you with their response.